Calais Campbell was one of the NFL’s best-kept defensive secrets when he towered over the desert in Arizona. It took him putting the big sacks in “Sacksonville” to break through as the league’s unquestioned best defensive player. 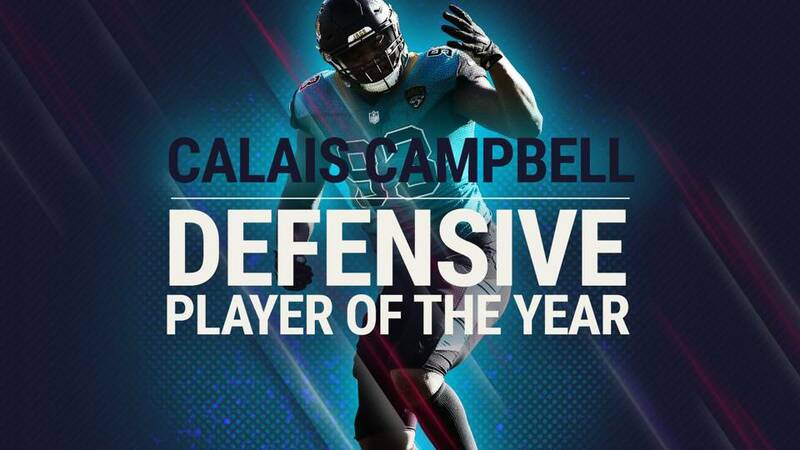 Campbell, 31, is Sporting News’ Defensive Player of the Year for 2017, an award voted on by his peers. A two-time Pro Bowler with the Cardinals, Campbell was named first-team All-Pro for the first time in his first season with the Jaguars. At 6-8, 282 pounds, Campbell got his chance to play regular defensive end in a 4-3 scheme in Jacksonville while still sliding inside on passing downs. The result was a career high-shattering 14.5 sacks, tied for second in the league with DeMarcus Lawrence and only behind his former Cardinals teammate, Chandler Jones. As a highly coveted unrestricted free agent last March, Campbell had a tough decision to make between his hometown Denver Broncos and Jacksonville, a lot closer to his college stomping grounds at Miami. The Jaguars, with plenty of money under the cap to spend, got the deal done, signing Campbell to a four-year, $60 million contract with $30 million guaranteed. He joined the team at the same time as former Texans cornerback A.J. Bouye and former Cowboys safety Barry Church to round out a budding elite defense built mostly over the previous three drafts. The Broncos (5-11) fell well short of the playoffs, while Campbell helped the Jaguars go from worst (3-13) to first (10-6) in the AFC South before their postseason run ended in the conference championship game. He had four sacks in his first game with his new team in Week 1 against the Texans, earning AFC defensive player of the week honors. Campbell would go on to record three more multiple-sack games in 2017. His work getting to the quarterback both off the edge and inside allowed end Yannick Ngakoue to break out with 12 sacks while playing either opposite or next to him. Campbell remained a dominant run defender, as well. The Jaguars had plenty of great defensive players on every level. Ngakoue and Bouye had fine seasons. Cornerback Jalen Ramsey and linebackers Telvin Smith and Myles Jack all were vital to Jacksonville’s high level of success in pressure and coverage, racking up sacks and atakeways. But because everything starts up front, Campbell stood tallest as the No. 1 part of the NFL’s No. 1 pass defense. Aaron Donald and Fletcher Cox had monstrous years at defensive tackle. Lawrence, Cameron Jordan, Von Miller, Khalil Mack, Joey Bosa and Melvin Ingram were also outstanding coming off the edge in various alignments. Campbell was able to emerge from that great group because of his versatility and veteran leadership for a young team that turned around on and off the field because of his presence. Campbell was a steal of a second-round pick for the Cardinals for many seasons. Ten years later, everyone now knows and respects him as Defensive Player of the Year.